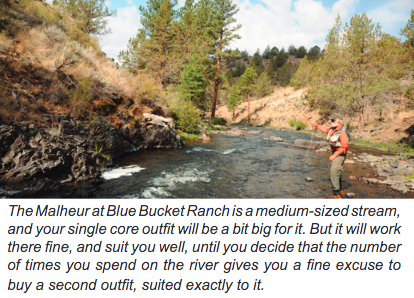 Assembling a core fly fishing outfit for Oregon’s WU waters might seem a bit specific, and therefore daunting. But it’s not. You’d use about the same thing on our waters as you would for a basic ‘exploratory’ outfit, as I like to refer to it. That’s the essential rod, reel, line, and surrounding set of gear that you’d like to be at the center of your gear. 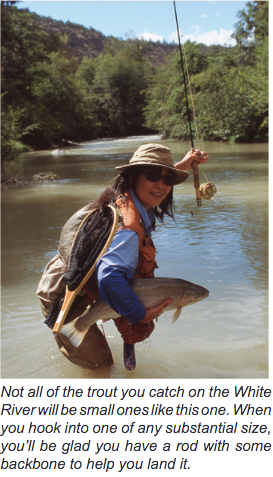 If you’re just setting out to arm yourself for fly fishing, it should be at the beginning of your purchases. . If you keep minimalism in mind, your task will be easier, your load lighter when you get out on the water, your wallet a lot happier, your outfit so versatile that it turns out to be the one I use for summer fishing on the Deschutes... though I know you’d never stray from WU waters to fish for stinky steelhead. Oregon WU waters are a mixed sort, but fortunately can be fished with one central outfit. The rod you want for the White River wants a bit of beef, to deal with the hefty trout located there. Not surprisingly, the same sort of rod will be best on the ponds, where the trout are not only stout, but the size flies you might want to cast can be a bit large. 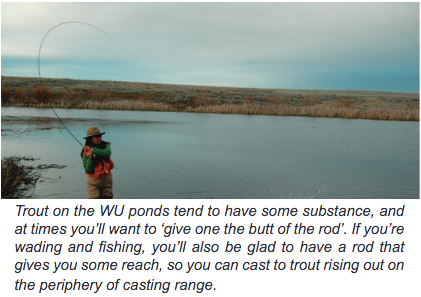 The same rod will work on the Malheur at Blue Bucket Ranch, though if you were buying a rod specifically for that water it might be a bit shorter and lighter. However, the stouter stick will not be any sort of handicap there. It will also fish well enough on tiny Tygh Creek, though that might be the one place you’d wish for something different...if it’s the only place you fish, which I doubt, then buy a small-stream outfit specifically for it. 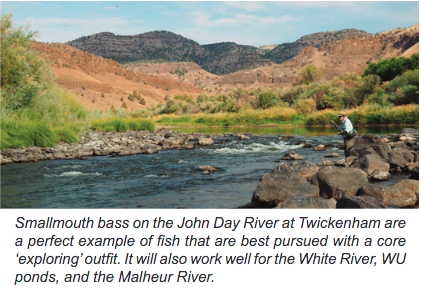 John Day smallmouth fishing calls for the same strong rod as the bulk of the other WU waters. You’ll want to cast long, and you’ll need to turn over bulky bass bugs, perfect work for the core outfit I’m about to describe. That core rod should be 9’ long, and rated by the manufacturer to be best balanced with a 5- or 6-weight line. If the rod manufacturer lists its rod actions from fast through medium to slow, you’d want the medium. Fast rods throw the line farther once you learn to use them, but I’ve taught casting in my distant past, and I didn’t find many folks who started right out being expert casters. It’s a lot more difficult to learn with a fast rod than it is to learn with a more modest one. The first and main line should be a floater, not a sinker, and in the way lines are described, a Weight-Forward ta- per rather than a Double-Taper. Here’s the tricky part, and it’s why I recommend you buy your outfit from a knowledgable shop: the best line for the 5-weight rod might be a 5- or 6-weight; the best for the 6-weight rod might be a 6- or 7-weight. And one or the other might be the best for me and the worst for you, with that rod. That’s why you go into a shop, get all the advice you can on rods, then ask to cast the rod you choose with the line weight for which it’s rated, and a line one weight heavier. If you’re not up to casting at even short distance, ask the shop clerk to help you by casting the outfit himself, but don’t let him cast over the horizon and tell you which line is best suited to him...you want the one suited to you and that rod. If you are like me, the line you choose will almost always be a WF6F for the 5-weight rod, a WF7F for the 6-weight rod. That bit of extra weight in the line will help slow the rod down, make it more suitable for most beginners. It will also help turn over the heavier and more bushy flies that tend to be most effective on WU rivers, and the strike indicators you might be using on the ponds. If you fish the ponds more than a little, a second line, on a spare reel spool, should be a clear intermediate. If you like to troll, or cast and retrieve sunk flies such as midge pupae and Woolly Buggers, it will be more than useful to you. You’ve chosen your rod and line, the centerpieces of the outfit. Now for the few things that round out an outfit. First, leaders. In keeping with minimalism, I buy 7-1/2 foot base leaders in 3X, which is short and strong. Then I carry tippet spools from 2X through 5X. This allows me to fish the leader as it is for bass or to fish a salmon fly nymph on the White. It also allows me to add tippet, finer and finer as I want to fish smaller and smaller, or to add smaller nymphs as trailers to the bigger ones. This little bit of bulk, the tippet spools in my vest, lets me fish any- thing from largemouth in spring on Wamic to tiny midge pupae beneath indicators on the ponds. Just so you’ll know, fluorocarbon leaders are better in most respects than standard nylon. They also don’t deteriorate in the environment for thousands of years. I still use nylon, and I still catch a fair share of fish. You need a set of nippers, essentially sophisticated fingernail clippers, to cut leader tags, and a hemostat to debarb hooks and to remove those same hooks from the mouths of trout. The nippers should be attached to your shirt or vest on a retriever. The hemostat can be clamped to a vest or shirt pocket flap. That’s all you really need, but you most likely will want either that vest or a belt or shoulder bag--formerly called a creel--to hold your fly boxes and other trinkets you’re certain to acquire. Keep them to a minimum. I use a vest in most trout fishing except on small streams. Its many pockets allow me to distribute the weight of such things as an excess of fly boxes, split shot and indicators for nymphing, the vials that I carry for pickling aquatic in- sects so I can examine them under a microscope, a pock- et camera, rain jacket, lunch sandwich, water filter bottle. If the wading is at all difficult, then you’ll need a wading staff on a waist belt, attached with parachute cord. I generally prefer sticks that I find along the streams that I’m fishing. Nothing brings back memories of a fishing trip like a beaver chewed wading staff pulled out on the next trip to the same stream. In my opinion, those wading brogues should be felted. I’ve read all the recent research that felt helps trans- port pathogens from one water to another. I’ve also read the even-more-recent research that begins to de-bunk all that. I know that wading soles without felt help transport me far more often into dunkings in the water. It won’t hurt to have a net on the streams, especially if you hook one of those monsters on the White. It will almost be necessary to have a net when you fish the ponds from a float tube or pontoon boat. If you do buy a net, get one of the modern ones with rubber mesh; it will save a lot of WU trout from death by handling. I’m sure I’ve overlooked a lot of things that you’ll want to purchase later. But the core outfit above, starting with rod, reel, line, and leaders, will get you out fishing the WU waters, which are so full of feisty fish of all kinds. And I know I’ve neglected fly boxes and flies. You’ll cer tainly need those, but I’ve covered them in past posts, and have taken up enough of your time for now.